Live it! 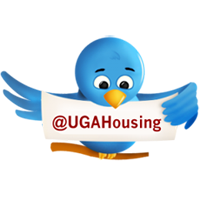 UGA Housing: Meet the 2012-2013 RHA Exec Board! At the beginning of this month, RHA representatives from across the campus came together to hear the speeches and view presentations from candidates for positions on the 2012-2013 RHA Executive Board. After the speeches were heard and an intense round of questions and answers followed, the ballots were tabulated and the results are in. 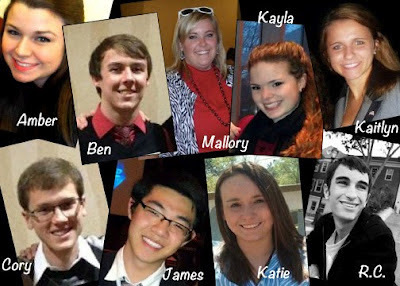 Please meet your newly elected 2012-2013 RHA Executive Board! I am Amber Painter, Political Science/Pre-Law major of the Class of 2014. I was elected Vice-President of the RHA this year, previously I was RHA secretary and a BCC Hall Representative. I am in the Honors Program, and a member of NRHH. I love living on campus, serving the residents, and planning awesome programs! My name is RC Goslee and I'll be returning as RHA's National Communications Coordinator for the 2012-2013 school year. I am a third year International Affairs and German major, pursuing a minor in Chinese language and literature. My main goal is to continue bringing recognition to the University of Georgia on the state, regional and national levels! Hey UGA! My name is Cory Shaw, I am a second-year majoring in Advertising and Political Science, and I will be the RHA Director of Communications for the 2012-2013 school year. My goal is to create greater awareness for RHA by utilizing the video capabilities of RHS, our daughter organization. Hey guys! My name is James Han! I am the 2012-2013 RHA treasurer elect. I am currently a first year Chinese and Sociology double major. I was born in Fort Lee, New Jersey where I was raised in a traditional Chinese household. I love to laugh, dance, and have lots of fun! My name is Katie Ackley and I am the secretary for the 2012-2013 academic year. I am an English major and self professed Twitter and Facebook addict. Meet Kayla. She's a second-year, pre-law student at UGA interested in International Affairs, Social Work, and Cognitive Science. Her favorite quote, by Ralph Waldo Emerson, is "For every minute you are angry you lose sixty seconds of happiness." She enjoys reading, and is an avid Harry Potter fan. Her favorite celebrities are Betty White and Kate Middleton. I'm a second year student from Dallas, Georgia. I'm majoring in Political Science with a Russian minor and have hopes of attending law school after graduation. My goal for the year is to strengthen the relationship between RHA and SGA while keeping the general body better informed of current legislation. I am from Toccoa, Georgia, and my major is Foreign Language Education and Spanish (Dual Degree) with a minor in TESOL. I am also studying American Sign Language and will be living in the ASL Multicultural Experience in Reed Community next year. This year I served as Vice President in 2011-2012, and am very excited to be transitioning to Executive Director of the National Residence Hall Honorary for 2012-2013.